Babylonian scholar of the third amoraic generation (third century); contemporary of Rab Judah b. Ezekiel. The two were known as "sabe de Pumbedita" (elders of Pumbedita, Sanh. 17b; 'Er. 79b et seq.). 'Ena once pronounced at the house of the exilarch a halakic discourse which greatly displeased his younger contemporary Rabbah, and the latter declared his statement to be astounding and himself to deserve degradation by the removal of his "meturgeman" (Ḥul. 84b; see Rashi ad loc.). Rab Naḥman, however, had a better opinion of 'Ena's learning. 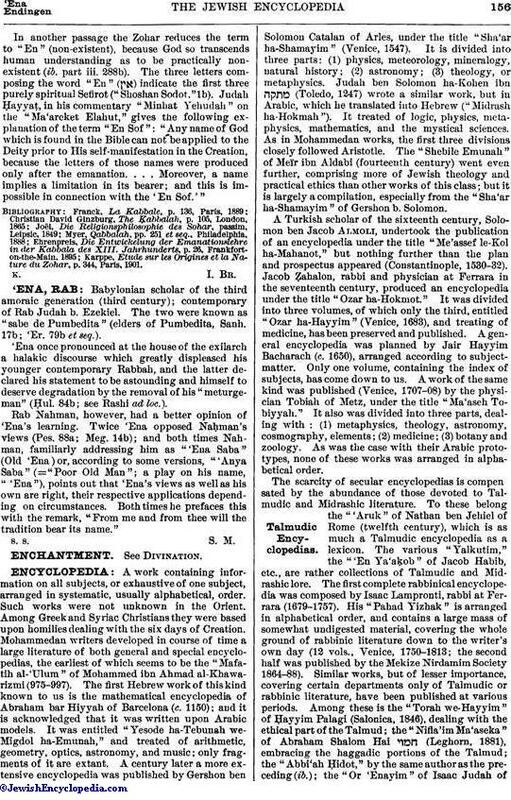 Twice 'Ena opposed Naḥman's views (Pes. 88a; Meg. 14b); and both times Naḥman, familiarly addressing him as "'Ena Saba" (Old 'Ena) or, according to some versions, "'Anya Saba" (= "Poor Old Man"; a play on his name, "'Ena"), points out that 'Ena's views as well as his own are right, their respective applications depending on circumstances. Both times he prefaces this with the remark, "From me and from thee will the tradition bear its name."